Abstract: Over time and through its evolution the European Union (EU) has increasingly evolved to become the new area for the development of Chartered accountants' activities. It not only affects and alters their professional lives as well as that of their firms and more generally, the profession of Chartered accountant functions in France and in other EU Member States. How do we understand the evolution of a regulated profession following the establishment of European directives that are impacting it? How do we best take advantage of this new economic area and accompany our clients in it? In the first part, the paper analyses the implementation of the "Services", "Recognition of professional qualifications", "Accounting" EU Directives and their transpositions into French law. Then, the second details the EU market reality which is constituted of mainly Small and medium-sized companies and who are the Chartered accountant's clients. 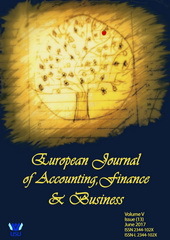 The third part in this paper presents some adaptations for Chartered accountant, which are necessary and desirable. Finally, this study bring to light that the major and "only" obstacles seeming to block Chartered accountants from servicing SMEs in the EU are: social law, tax law, national languages and certain psychological barriers. All which are surmountable as long as accounting professionals are motivated and view the European Union as our common living space and national territory. Now one question is being raised: How can we conceive of serving a client in the European Union, a Union which is now actually debating its founding principle of free movement? Abstract: This study assesses socio-demographic variables on the demand for health insurance in Lagos State. For this purpose, the researchers have been able to examine selected socio-economic and demographic variables and their effects on health insurance accessibility and desire of individual households. The explanatory research design was employed. A convenience sampling technique was adopted. Data was gathered from individual households within Alimosho and Ojo Local Government Areas of Lagos State through the use of an interviewed schedule. The sample consisted of 212 respondents made up of individual households within the sample areas. Data collected was analysed using multiple regression technique. The study was able to establish some level of contributory linkage between selected socio-demographic variables and demand for health insurance. The findings show that while education and income both appeared to have significant effect, gender and age both have positive contributory effect. The study therefore recommends that health insurance providers should endeavour to education the larger society of the significance of health insurance products to human existence. Secondly, a robust strategic health insurance outlines should be designed to incorporate the vulnerable ones in the society to ensure equality and fairness in the provision of National Health Insurance Scheme. Lastly, Health Maintenance Organisations should endeavour to implement flexible payment plans for participants in order to improve participation of more individuals. Abstract: The survival of the banks is mainly based upon profits earned from its loans issued to the general public. The purpose of this research is to study the impact of nonperforming loans, loan loss provisions, loan to deposit and size of the bank on the profitability of both Islamic and conventional banks of Pakistan. Secondary data was used from the annual report of the selected banks from (2007-2014). Ordinary least square regression was used and results showed that profitability of conventional banks has negative relationship with non-performing loan and positive relationship with size of the bank and loan to deposit. On the other hand, the profitability of Islamic banks showed positive and significant relationship with size of the bank while nonperforming loans, loan loss provisions and loan to deposits were found insignificant in Islamic banking sector.